toybot studios: Paintball War Machine....!! I don't play Paintball, but if I did, I would want this guy on my team. This $1,200 remote controlledPaintball Robot. Chris Rogers is using Kickstarter to raise $15,000 in order to start this project. If you pledge $1,200, you get one. 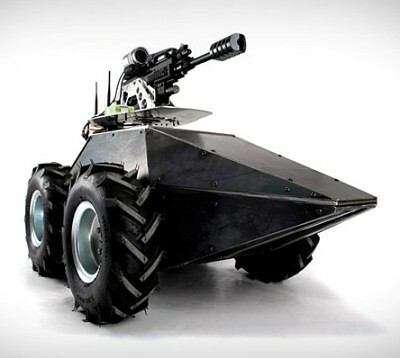 I want to make a tracked robot with a paintball gun. The robot and gun will be controllable from a distance. The gun will have elevation- the ability to tilt up and down. The tracked base should be able to rotate in place and climb stairs. By rotating in place I should have the inherent ability to pan- rotate the gun horizontally without adding a separate, expensive and heavy pan mechanism. I want to make something light enough so that one person can carry it.